People ask me if I only eat craft (higher end) chocolate. They seem disappointed when I tell them I do love artisan-made dark chocolate, but I sample a wide variety of items made with cacao. 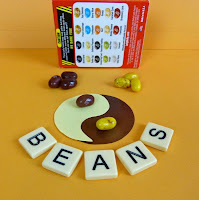 These same people might be particularly offended by the pile of 45 jelly beans that I lined up in pairs today -- beans with flavors like diaper wipe vs. coconut; skunk vs. licorice; and centipede vs. strawberry. 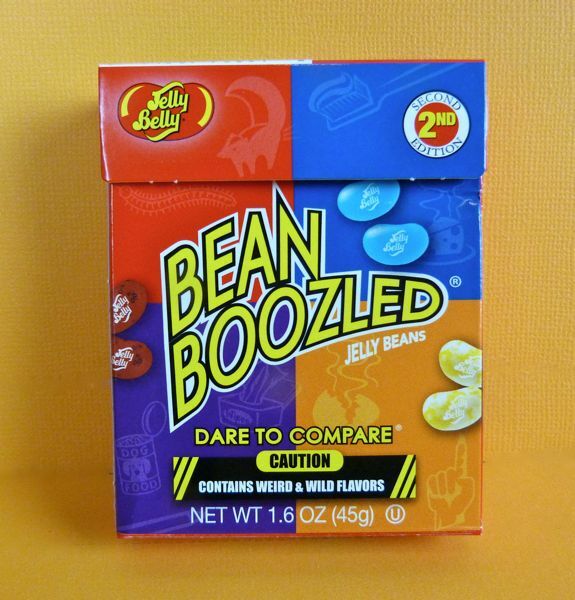 The diabolical creators of these "Bean Boozled" jelly beans (look-alike pairs of beans that are anything but) at Jelly Belly Candy Company must chuckle when they see people gagging and choking on the "wrong" jelly bean. Thanks Megan for this box of jelly beans, filled with promise and peril. 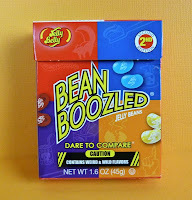 The toothpaste jelly beans weren't too bad, but the rotten egg ones were hastily spat out. I could go on; however, since today was Day #8 of Chocolate and Banana Theme Week, I'll focus on these two flavors, and their evil twins in this 2nd Edition collection. There were four brown beans in this box that were the same color. The Chocolate Pudding jelly bean(s) looked just like the Canned Dog Food jelly bean(s). Unfortunately, the first three brown beans tasted like puppy dog chow (or what I imagine canned pet food might taste like). Thank goodness, the fourth bean was the Chocolate Pudding flavor. Hurray! It certainly tasted much better than the dog food flavor. I had the same thing happen when I was trying/hoping for the banana flavored bean. Three failures, followed by a final success. The first 3 beans were an amalgam of artificial flavors in addition to a hint of old No. 2 pencil. Biting into the last bean and finding the (one and only) Top Banana bean was a relief. 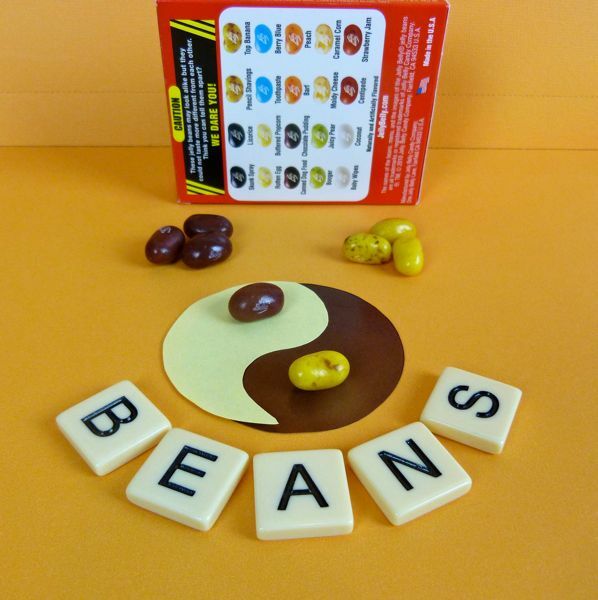 The success of these odd-flavored beans shows how curious we humans are. The timing is, however, perfect (the week before Halloween) for a truly frightening treat.